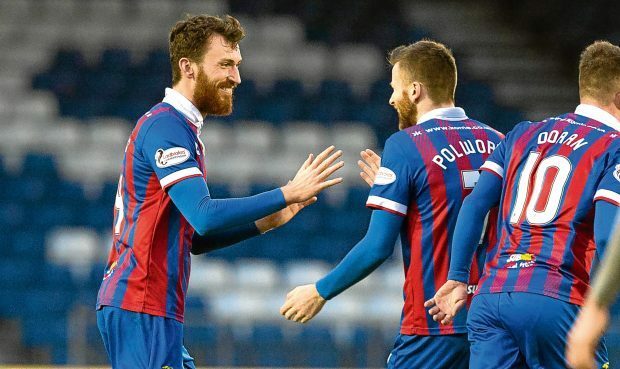 Caley Thistle midfielder Joe Chalmers reckons Inverness are the most attractive team in the Championship and he hopes they can get the results to match. Inverness have shown improvement following a poor start to the season after their relegation from the Premiership but remain seventh in the table. John Robertson’s men are unbeaten in their last five matches, a sequence that included their IRN-BRU Cup triumph against Dumbarton. Chalmers feels Caley Jags have reaped the rewards of sticking to their principles through difficult patches of form and he said: “I have not seen a team that plays better football than us this season. We always try and pass and play in the right way. “It’s important we stick to it no matter if we are getting the results. Even when we were not getting the results, we could see in our play that if we stuck to that it was a matter of time before it turned. It was not as if we were getting beaten heavily or were not creating chances. We just had to finish them off a bit better. Chalmers’ double in Tuesday’s 4-0 win against Brechin City took his tally to four for the season, having only netted his first career goal in a 3-1 victory over Queen of the South in January. The 24-year-old joined from Motherwell last summer as a left back but has been pushed forward into midfield by Robertson and he is keen to continue chipping in with goals. He added: “I’m usually buzzing if I get one so I’m delighted to get two and obviously it helped us on our way to a good win. “It’s something I’m learning when after stepping into the midfield role. The manager has been on to me about getting more forward runs, getting more shots off and making forward passes. It’s still something I need to improve on but the goals have come lately. Caley Thistle remain 11 points adrift of the play-off places with seven games remaining, although they have three games in hand over third-placed Dunfermline, and Chalmers says his side will not give up hope, adding: “Until we find out that we cannot do it, or we drop points that we would be disappointed in, of course we believe.